Spurred by poverty, racism, and tension between residents and the city’s police, riots break out in L.A.’s Watts neighborhood. Lasting six days, the worst rioting yet seen in the city’s history will count more than 3,000 people arrested, over 1,000 injured, and 34 dead. The Watts riots, sometimes referred to as the Watts Rebellion, took place in the Watts neighborhood of Los Angeles from August 11 to 16, 1965. On August 11, 1965, Marquette Frye, an African-American motorist on parole for robbery, was pulled over for reckless driving. A minor roadside argument broke out, and then escalated into a fight with police. False rumors spread that the police had hurt a pregnant woman, and six days of looting and arson followed. Los Angeles police needed the support of nearly 4,000 members of the California Army National Guard to quell the riots, which resulted in 34 deaths and over $40 million in property damage. The riots were blamed principally on police racism. It was the city’s worst unrest until the Rodney King riots of 1992. 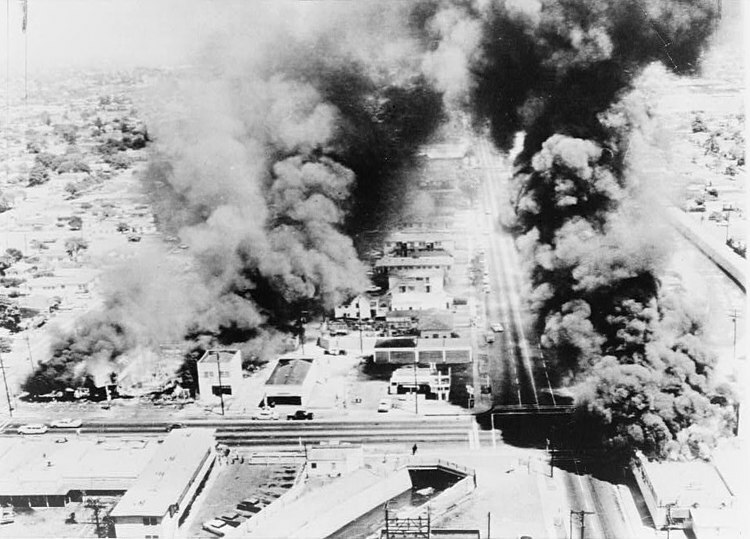 (1965) South Central Los Angeles engulfed in flames and rioting. Clive ‘Kool Herc’ Campbell is throwing a party in the rec room of his South Bronx, New York, apartment building and he plays dance music on the ‘Merry Go Round,’ two manually-controlled turntables. It’s a great success, and DJ Kool Herc will be hailed by many as the father of hip-hop. Writer/director George Lucas takes moviegoers back to the early 1960s with stories of drive-ins, high-school sock hops, and cruising the strip. The cast includes Richard Dreyfuss, Ron Howard, Mackenzie Phillips, and Cindy Williams, as well as a cameo from another future TV star. A law passed two years earlier takes effect, and Mountain Day is an official holiday in Japan. The idea came from hiking groups who wanted a holiday to celebrate the country’s terrain and geography. This date (8/11) was chosen since the Kanji character for 8 looks like a mountain, and 11 looks like two trees. A constitutional assembly in Weimar, Germany, adopts a parliamentary democracy, the first in the country's history, replacing centuries of imperial rule. The massive chaos and loss caused by German defeat in World War I has led to the Weimar Republic, but Nazi rule is less than 15 years away. Weimar Republic was an unofficial, historical designation for the German state between 1919 and 1933. The name derives from the city of Weimar, where its constitutional assembly first took place. The official name of the state was Deutsches Reich; it had remained unchanged since 1871. In English the country was usually known simply as Germany. A national assembly was convened in Weimar, where a new constitution for the Deutsches Reich was written, and adopted on 11 August 1919. In its fourteen years, the Weimar Republic faced numerous problems, including hyperinflation, political extremism, as well as contentious relationships with the victors of the First World War. The people of Germany blamed the Weimar Republic rather than their wartime leaders for the country's defeat and for the humiliating terms of the Treaty of Versailles. However, the Weimar Republic government successfully reformed the currency, unified tax policies, and organized the railway system. Weimar Germany fulfilled most of the requirements of the Treaty of Versailles although it never completely met its disarmament requirements, and eventually paid only a small portion of the war reparations. Under the Locarno Treaties, Germany accepted the western borders of the republic, but continued to dispute the Eastern border.